Disco dobre donde el genio brasilero toca junto con Academia De Danças. Así que tenemos genialidad por partida doble. La música de Gismonti cubre, como siempre, una amplia gama de paletas sonoras, texturas, dialectos musicales y estados anímicos. Puede sonar grandilocuente o introspectivo y minimalista, dramático o lúdico, nostálgico o vanguardista, docto o popular. Y es que entre las principales influencias podemos mencionar a Heitor Villa-Lobos, Maurice Ravel, Django Reinhardt, John McLaughlin, Baden Powell, Astor Piazzolla, el folclore brasilero, la música indígena y la música india, entre otras. Ello es plasmado en estas composiciones han sido compuestas para distintos instrumentos que varían desde los correspondientes a la orquesta sinfónica, o intrumentos étnicos o los teclados electrónicos. 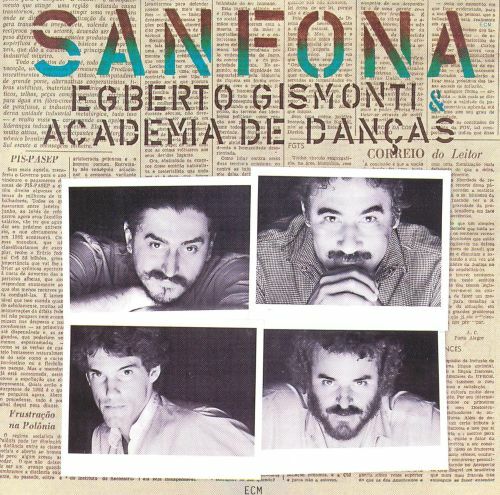 Sanfona is an album by Brazilian composer, guitarist and pianist Egberto Gismonti recorded in 1980 and 1981 and released on the ECM label. The double album features one disc of studio material with Gismonti's Academia de Dancas quartet and one disc of solo material recorded live. How has someone not made a bigger case out of this? Egberto Gismonti started his career as more of a Brazilian popular musician, (despite already being quite experimental in his his early albums, showing very high compositional and instrumental level), and then he went on to to PROG. His prog might be the most original in Brazil, because it blends Brazilian popular music, jazz, and prog rock. Most of other progs usually ignore all Brazilian roots in favor of foreign rhythms, with exception of some prog folks such as a Barca do Sol, whose godfather was none other than Gismonti himself. I do not know if it would be a prejudice against jazzy chords and progressions or latin rhythms that prevent him from being here? I think progarchives is quite an open-minded website, and I am sure there is a lot of latin and jazzy stuff here. I mean, there is some Miles Davis cool jazz and Herbie Hancock post-bop jazz under the jazz-fusion rock. So why not Egberto's prog records, which are more closer to prog obviously? After 2-3 records experimenting with prog, he moved on and became this world jazz giant, recording many memorable albums for ECM, including a couple with jazz legends Jan Garbarek and Charlie Haden. But his two records, Academia de Danças and Corações Futuristas definitely have their hearts on prog. It may be weird for someone not familiar with Brazil's rhythms and harmonically complicated chords and melodies - and I hope I don't come off as an arrogant idiot - but this is what prog fans love, you just have to get to know it. It's truly beautiful, symphonic brazilian jazzy prog. These Egberto albums and Barca do Sol's discography may not be considered the best in prog to come out of Brazil, but they definitely represent the most Brazilian prog albums, that did not not abandon their roots..
Gismonti delivers this impressive mixed set for his third ECM release. The first half features Gismonti's Academia de Dancas quartet on a handful of originals, including the popular "Frevo." The band features Zeca Assumpcao on bass, Mauro Denise on reeds, Nene on percussion, and Gismonti on both guitar and piano. For the second half, Gismonti goes solo on acoustic guitar, Indian organ, and voice for a lovely program taped live in Munich. With fine notes and spoken bits by Gismonti, listeners will find much in the way of Brazilian musical and cultural history to compliment the music. A perfect overview for the curious fan. The accentuating winds of “Marcatu” waft past our noses. The scent is moist, hinting at lichen. Our breathing quickens us as we climb into thinner air, compensated by a majestic and quiet beauty in all directions. Gismonti’s piano introduces itself as the traveler who will be our guide. As he works his magico on the keys, bass (Zeca Assumpção) and drums (Nene) assume his lead, leaving Gismonti running with a saxophone (Mauro Senise), and us, following close behind. Every gesture of “10 Anos” is another footstep tracing the outskirts of a place unknown. And without knowing it, we have become one person. We wish to introduce ourself to the new community in the vale, into which we have now crossed. Drums nip at our heels as we find ourselves propelled by the downward slope. We are welcomed with ceremony in “Frevo.” But then, a lone figure cuts through the celebration, bringing with him the possibility of destruction. Instead, he shows us the wisdom of local ways, observing proper form in the presence of new life, the possibilities of love, and the realities of an ever-changing kinship. As the forest yields ancestors’ whispers, that their progeny might better survive, so too are voices encamped here among their people, where fires burn low and judgments even lower. Yet somewhere in the shadows, the saxophone lies in wait, trickster in disguise. Whatever mischief lies in store, however, is dispelled by the crystalline joys of “Lôro.” Here we find rebirth, brought forward to a council of harmony. A four-part tribute follows, an epic in true Gismontian fashion. This time around, his guitar returns cloaked in the shadows of pianism, carried by an airborne saxophone. Every fluted note is an ensnared animal, gift of the hunt and of the gather. Recounting those undeniable moments of community that embraced us, we hear the voices of our own past in the harmonium, bleeding into guitar and drums. From this tenderness emerges “De Repente,” an engaging 12-string interlude that could give Gustavo Santaolalla a run for his money any day. And run it most certainly does, as if after spending time in the village, we find our heart also ensnared, only now by the life we abandoned on our way to getting here. And so, we take these feet and put them to the ground as quickly as they will, running hand-in-hand with the person we once were. The Ralph Towner-like diction here makes for one of Gismonti’s most captivating solo pieces. In our wake we leave the lamenting “Vale Do Eco.” The newly escaped continues in our place, lost and alone. In “12 De Fevereiro” we become her lullaby as she lays herself among the ferns and slumbers. And there she stays until a new village grows in her place, her dream at last realized in “Carta De Amor” before making her final leap into a rare green flash that halos the setting sun. This album is a perfect example of what “World Music” really should be: not music of this, or any, world, but music that is a world in itself. Arguably Gismonti’s best date on any label and an essential one for your collection. Duas Vozes (ECM 1279) with Naná Vasconcelos appeared in 1984. Today Gismonti strives to bring two influences together, Western Europe music and the music from Brazil. Dança dos Escravos (ECM 1387), released in 1989, takes him a step further in the direction where distinctions between “serious” and “popular” music are blurred. In harmonic terms, Gismonti has found a way of combining two cultures, as in the music of Villa-Lobos, Baden Powell or João Gilberto. His rhythms, also extremely delicate and carefully constructed, never suffer from a lack of pulsating energy.